If your first deposit is $1,000 you will get $150 forex bonus instead of $75, which is also directly deposited into your newly created account. Same conditions apply. If your first deposit is $10,000 you will get $1,200 forex bonus instead of $75, which is also directly deposited into your newly created account. Same conditions apply. 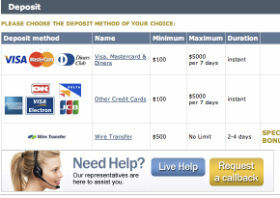 You create an account at AVAFX and make a first deposit of $300. 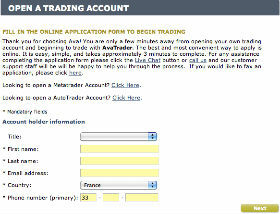 AVAFX will deposit $75 bonus into that account, so that it now totals $375, ready for trading. AVAFX was founded in 2006 and has now over 150,000 registered customers in more than 150 countries, who execute 1,5 million trades each month. The total trading volume reached by AVAFX's customers exceeds $40 billion per month. It is one of the most user friendly forex brokers that actually reaches out to its customers for new ideas and innovations, and keeps tweaking its trading platform. Their customer support is excellent. 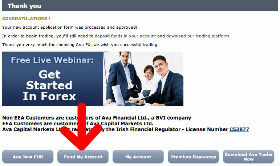 The minimum account at AVAFX is $100 and the maximum leverage it offers is 200:1. In addition to all the important currency pairs -including many cross currency pairs- it also offers commodities trading and stock trading (through CFD's), which is a great way to trade stocks and commodities like oil and gold without having to invest thousands of dollars. You can use the instant forex bonus for all the products offered by AVAFX, including commodities trading and stock trading. AVAFX is regulated by BVI and has applied for NFA regulation. 5. AVAFX Deposits Forex Bonus!